Useful, Applicable Brain Activity Algorithms. Algorithms are designed for the purposes of measuring and optimizing brain function. They are used within applications, built by NeuroSky, third party developers and our OEM partners. Get to market faster with NeuroSky pre-built algorithms. NeuroSky algorithms provide the foundation of a universe of applications that can be built to optimize brain health, education, alertness and overall function. To learn more about building applications based on our algorithms, visit our developer page. The Attention Meter algorithm indicates the intensity of mental “focus” or “attention.” The value ranges from 0 to 100. The attention level increases when a user focuses on a single thought or an external object, and decreases when distracted. Users can observe their ability to concentrate using the algorithm. In educational settings, attention to lesson plans can be tracked to measure their effectiveness in engaging students. 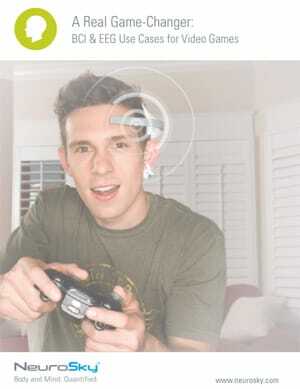 In gaming, attention has been used to create “push” control over virtual objects. The Meditation Meter algorithm indicates the level of mental “calmness” or “relaxation.” The value ranges from 0 to 100, and increases when users relax the mind and decreases when they are uneasy or stressed. The Meditation Meter quantifies the ability to find an inner state of mindfulness, and can thus help users learn how to self correct and find inner balance to overcome the stresses of everyday life. The algorithm is also used in a variety of game-design controls. The Blink Detection algorithm signals a user’s blinks. A higher number indicates a “stronger” blink, while a smaller number indicates a “lighter” or “weaker” blink. The frequency of blinking is often correlated with nervousness or fatigue. Eye blinks are akin to a standard on/off binary system and therefore are valuable for controls that require definitive responses. For instance, in communication applications, one blink means no, two mean yes — giving individuals with a special needs a simple way to communicate. The Mental Effort algorithm measures the mental workload while performing a task. The harder a user’s brain works on a task, the higher the value. The algorithm works well with both physical (e.g., drawing) and mental (e.g., reciting) tasks, and can be used for continuous real-time tracking and between-trial comparisons to measure the effects of multi-tasking, workload variability, and more. The algorithm can be used to track the effects of diverse cognitive loads on the ability to learn and provide feedback for user self-improvement. The Familiarity algorithm tracks learning processes to measure the relative level of understanding, learning, or comfort with a task. It is a measure of the subconscious learning of procedural (motor) and mental tasks. In some cases, it reflects how well a user is doing with the task. By observing trends, users can better understand and assess their learning process. It can be applied to tasks that are physical in nature (e.g., drawing) or mental (e.g., recitation), and enable data-tracking assessments to gauge learning status. The Appreciation algorithm provides real-time measurement of the level of enjoyment or appreciation a subject feels towards an external audiovisual stimulus. The algorithm allows moment-by-moment detection of emotions. In marketing applications, it can be used to track and understand a users level of appreciation, providing insights and strategic direction for marketing efforts. Emotional spectrum measures the intensity (low-high) and pleasantness (pleasant/unpleasant) of emotional activity. Pleasant/Unpleasant identifies whether a user is having a pleasant or unpleasant emotion. Pleasant emotions could be happy, serene, relaxed, etc. Unpleasant emotions could be anger, disgust, depressed, etc. Intensity measures how strong a user’s emotions are in real time. The emotion could be happy, angry, calm, or any other emotion. 4 eTensity levels Very Weak – Weak – Strong – Very Strong. Cognitive Preparedness measures the brain’s capacity for optimal cognitive performance on a relatively complex task or in other words, the brain’s capacity for higher level cognitive functions. Creativity measures the brainwave activities underlying creative cognition. The higher the Creativity value, the stronger the brainwave activities promoting innovative and creative thinking. Alertness measures user’s alertness or vigilance level at the moment. High alertness value indicates you are at a state of focus while low value represents a relaxing state of mind. Discover how BCI & EEG technology can be integrated into your upcoming video game and help it stand out from the competition—download the video game use cases now.